Summer is nearly upon us, and it's a real possibility that someone will forcibly remove you from the house in order to vacation, in which case, you'll need a beach read to ward off the console cravings. Ready Player One, a novel about a dystopian future so bleak that people choose to live almost entirely in a fictional world, is here for you. It's the year 2044, and the real world is an ugly place. The only solace is OASIS, a virtual solar system made up of 10,000 planets created by brilliant fiend James Halliday. Regular guy Wade Watts spends a lot (ok, almost all) of his time in OASIS, dreaming of winning the hidden golden ticket that would net him a significant chunk of cash and power. When he solves the first of several of Halliday's puzzles by weilding his profound knowledge of late 20th-century pop culture (e.g., The Goonies, Dungeons & Dragons, John Hughes movies, Devo lyrics, etc. ), he suddenly finds himself entwined in a battle for the prize that's being watched by, oh, just the entire real world. He's got the pop-culture goods, but there's a teeny problem: some of his competitors are willing to commit real-world murder to keep him from winning. 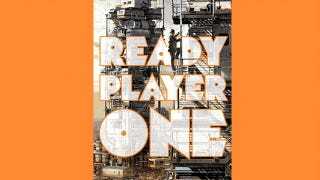 Fanboy-co-writer Ernest Cline's debut novel Ready Player One has been called a quest novel, a love story, and a virtual space opera. It's basically your dream summer read. Check out the excerpt below, then order your copy of Ready Player One. Your forced-to-go-to-the-beach self will thank you.